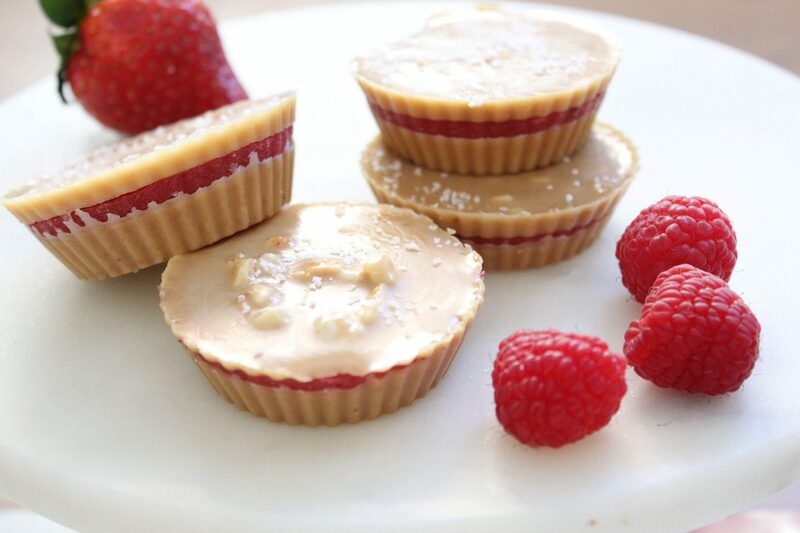 That coveted mix of sweet, savory, creamy, and crunchy makes it into these delicious keto peanut butter and jelly fat bombs. We use a bit of gut-healing gelatin and low-sugar berries to firm up our ‘jelly’ layer. We also extra fat added to our peanut butter layer in the form of coconut oil. The top of these delicious fat bombs are sprinkled with a little sea salt for a burst of saltiness. The saltiness melts into creamy peanut butter and finally finishes sweet-tart burst of fruit. These peanut butter and jelly fat bombs are my children’s favorite. I’m happy to serve them as a high-fat treat after meals to help them stay full longer, and get the fats in that are so important for growth and brain function. Peanut butter– Rich in protein, healthy fats, and full of flavor, peanut butter is used in these fat bombs to give them the classic flavor. I buy this kind of organic peanut butter. Coconut Oil– I prefer to use expeller pressed coconut oil in this recipe to keep it from overpowering the other flavors. Rich in medium-chain fatty acids needed for energy and brain function, this oil is easily digested and helps the fat bombs keep their shape when chilled. Sea Salt– Sea salt contains trace minerals and electrolytes that are helpful for everyone, and especially those on the ketogenic diet. I like this unrefined sea salt for using in recipes. Flake sea salt is a pretty garnish for the top of fat bombs and more. I like this flake sea salt for garnish on top. Strawberries & Raspberries- Most berries are low-carb fruits. They can be included in a limited amount in a ketogenic diet for most people. Their bright fruit flavor and color will brighten anyone’s day. All berries should be chosen organic when possible. 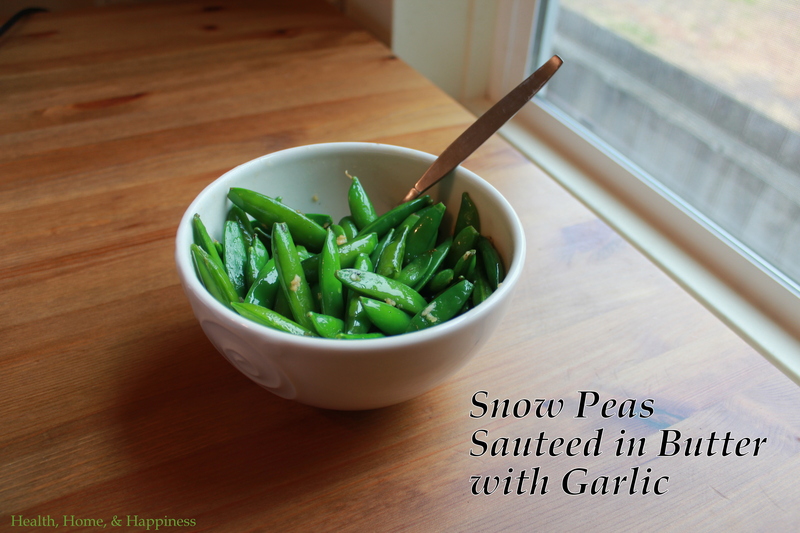 Frozen (thawed) works well in this recipe. Gelatin- Used to firm up the ‘jam’ center of these PB&J bites. 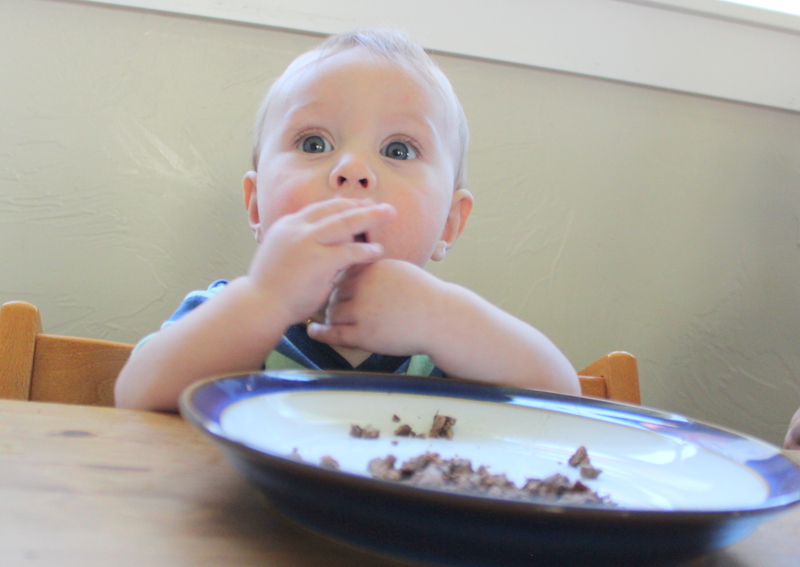 I choose organic grassfed gelatin for superior taste and health benefits. Stevia– Stevia is a natural plant sweetener. It has been refined, but such a small amount is used in recipes that I don’t mind using refined stevia. I use this kind of stevia, which comes in packets for easy measuring. Typically, ‘one serving’ of stevia from any brand will work equally- simply use ‘one serving’ where I have indicated ‘one packet’ in the recipe. Stevia comes in liquid and powdered form. You can also adjust stevia to taste as needed. If you are only looking to increase calories, and are not low-carb, use a tablespoon or two of raw honey in the ‘jam’ in palace of the stevia. Another tablespoon of raw honey can be added to the peanut butter mixture to make them a bit sweeter and add in a few more calories. Nutbutter such as almond, or seed butter such as sunbutter can replace the peanutbutter and accommodate allergies. Please note, that the nutrition facts are no longer accurate if any changes are made to the recipe. It is best to calculate your own nutrition facts if needed, using the specific brands of ingredients that you are using. The classic combo, in fat-bomb form! Combine the vanilla, peanut butter, and coconut oil in a small heat-proof bowl. Pour half the peanutbutter mixture into 6-12 small silicone muffin liners or othersilicone molds. The molds and/or muffin liners can be up to 1/3 full, and they can be less full but not more. Pop the first peanut butter layer into the freezer (or, if it's winter where you live you may be able to set them out on the porch for this step!) and combine the gelatin, raspberries and strawberries, and stevia with an immersion blender in a small saucepan. Allow the gelatin to absorb the berry juice for 5 minutes, and then heat over medium heat for 3-5 minutes until it is melty again. Allow to cool for about 10 minutes (so it won't melt the peanut butter mixture too much) and then pour the berry mixture evenly over the peanutbutter mixture. Freeze again, for about 10 minutes. If necessary, re-melt the peantubutter mixture that is remaining. Once the jelly layer is set, pour the rest of the peanutbutter mixture evenly over the fat bombs. Top with a tiny bit of flake sea salt if desired. Set in the fridge to set. Once set (4+ hours), pop the fat bombs out and keep them covered, in the fridge, for up to 1 month. 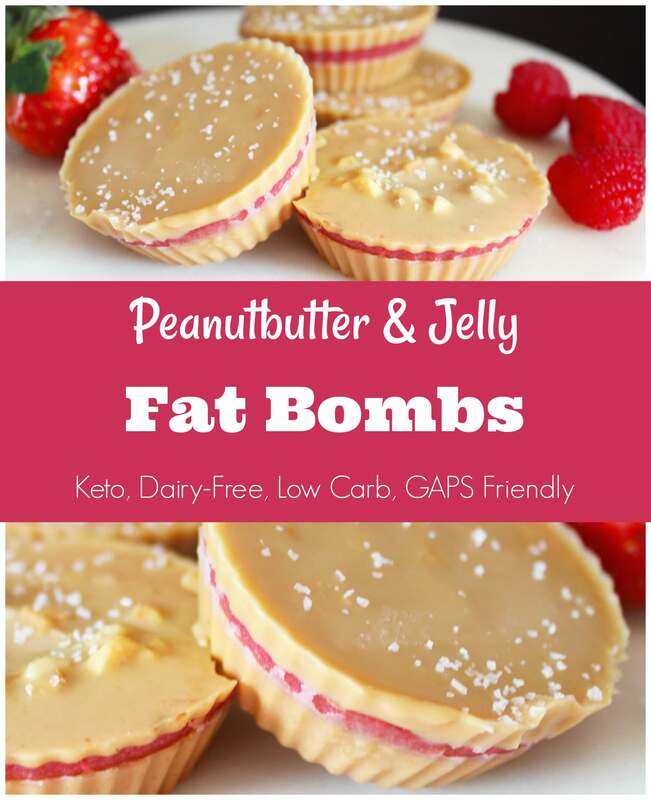 Looking for more delicious fat bombs for the keto diet? Click here! Going to try these this weekend. Thanks!